The five articles outlined below have been chosen to illustrate the range of hematology articles published in STEM CELLS during 2018. All reflect the editorial policy of emphasizing mechanistic studies that have the potential to lead to a better understanding of disease and possible cell-based treatments. Gene-engineered T cells incorporating a chimeric antigen receptor (CAR) have generated remarkable responses for patients with B cell malignancies. 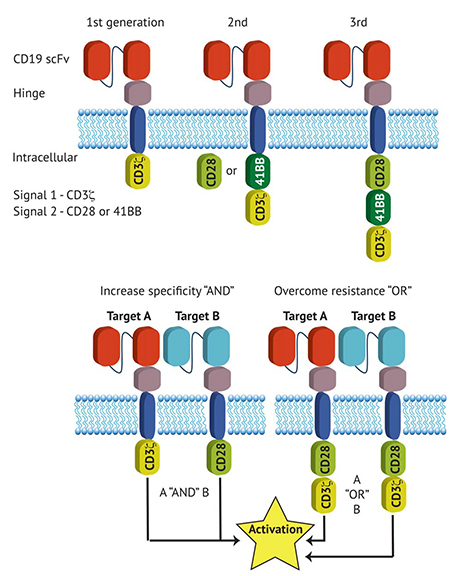 Michael Jain and Marco Davila succinctly review the development and clinical application of CAR T cells, a poignant bench-to-bedside story of the clinical translation of a therapy conceived in the 1990s. Clinical results have demonstrated efficacious responses in patients with the CD19 positive diseases B cell acute lymphoblastic leukemia and diffuse large B cell lymphoma. Hard lessons have been learned along the way and challenges remain, but the pioneering clinical trials have provided insights for future development. In a Concise Review, intriguingly entitled “Cheating Death for a Better Transplant”, Sehar Afreen and colleagues point out that successful transplantation in various malignant and non-malignant hematological diseases depends on the number and fitness of the donor stem and progenitor cells. Preservation of the cells prior to transplantation is a vital step of the procedure, and is profoundly influenced by sampling procedure, sample handling and cryopreservation. Experiments in mice indicate that BCL-2 proteins are central to the maintenance of stem and progenitor cells. This can be achieved by short-term inhibition of apoptosis, and is preferable to the inhibition of BIM or BMF by overexpression of BCL-2 and BCL-XL which poses risks of lymphomas and autoimmunity in the recipient mice. 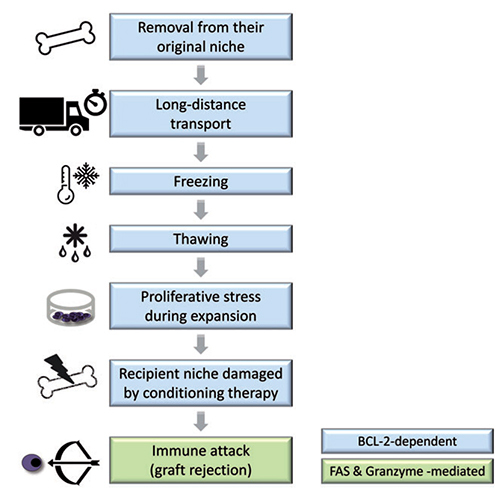 Preventing cell death by inhibition of BCL-2 regulated apoptosis may therefore provide a useful practical means to preserve stem cell quality for patients with serious hematological conditions. Hematopoietic stem cells (HSCs) of aging individuals become dysfunctional, limiting their usefulness in bone marrow transplantation. 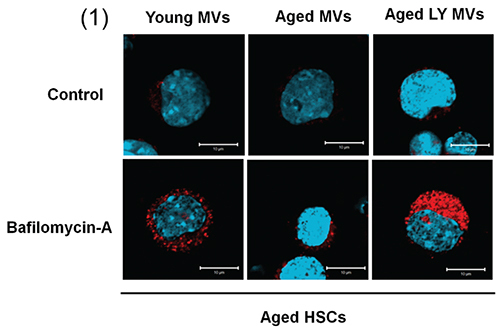 Rohan Kulkarni and colleagues report the interesting observation that brief incubation of aged HSCs with young mesenchymal stem cells (MSCs) restores their functionality. This rejuvenation process depends on the intercellular transfer of microvesicles which harbor autophagy-related RNAs. A novel finding of the study is that aged MSCs possess activated AKT signaling which affects the RNA profile of their vesicles. Intercellular transfer of these vesicles causes aging of the HSCs. Interestingly, vesicles collected either from young MSCs or from aged MSCs treated with AKT inhibitors rejuvenate aged HSCs and restore their functionality. Since age-related changes in human HSCs are similar to those observed in mouse HSCs, suggesting that the process is evolutionarily conserved, such pretreatment of aged HSCs may have clinical benefits, particularly in older patients undergoing stem cell transplantation. 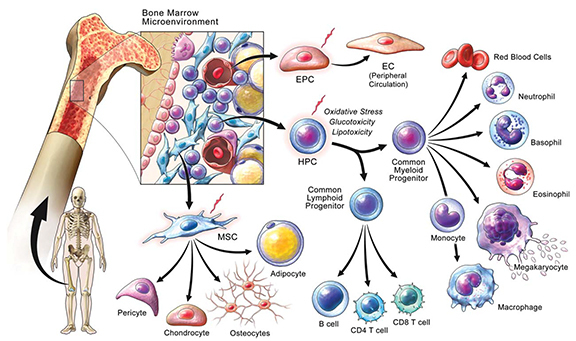 In principle, pluripotent stem cell-derived hematopoietic progenitors (P-HPCs) represent an alternative to bone marrow transplantation, but their ability to engraft in the bone marrow of recipient animals is poor. 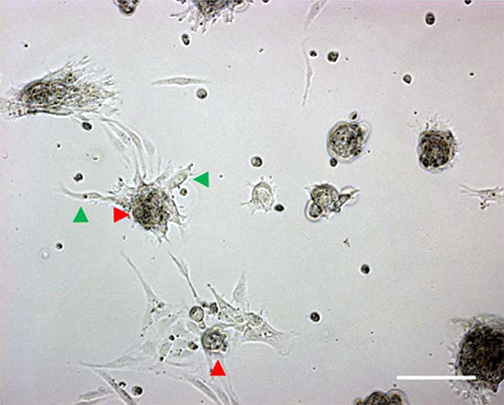 Current evidence suggests that defects in the migratory and homing capacity of the transplanted cells are due to misregulation of mRNA expression and lead to their failure to engraft. In an elegant study, Ellie Meader and colleagues compared the expression profile of hematopoietic progenitors derived from pluripotent stem cells to those derived from marrow. They found that a network of microRNAs affecting epithelial-mesenchymal transition or metastasis are highly expressed in the pluripotent-derived cells and hypothesized that this leads to an adherent phenotype with a defect in hematopoietic differentiation. Five of the miRNAs shown to maintain high expression in P‐HPCs, but not in HSCs, were chosen for inhibition, based on their well‐defined and validated roles in the EMT process. Although the expression of the target miRNAs was robustly inhibited, the effect on the expression of key EMT‐associated transcription factors that are targets of some, or all, of the inhibited miRNAs was not statistically significant. Thus a need remains for further mechanistic studies to establish the cause of the failure to engraft, which could ultimately pave the way for a valuable source of cells for transplantation. Critical limb ischemia (CLI), caused by peripheral artery disease, is characterized by unacceptably high morbidity and mortality. In an absorbing account of recent preclinical and clinical studies Mohammad Qadura and colleagues propose that optimized blood vessel formation may require paracrine and structural contributions from a repertoire of progenitor cells, angiocrine-secreting myeloid cells, tubule-forming endothelial cells, and vessel-stabilizing perivascular cells derived from mesenchymal stem cells. A better understanding of the coordination of this myriad of cells and their signaling may therefore be the key to translating the potential of stem cells into curative therapies for CLI. Emerging concepts and technologies point to the integration of multiple bioengineered matrices and multiple cell types to expedite progress toward cell therapy trials for CLI.